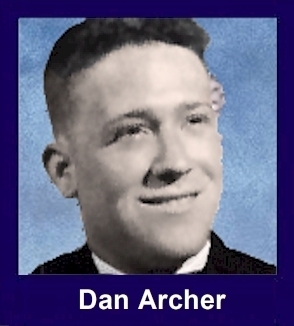 The 35th Infantry Regiment Association salutes our fallen brother, PFC Dan Willie Archer Jr., who died in the service of his country on July 15th, 1967 in Quang Ngai Province, Vietnam. The cause of death was listed as Small Arms/AW. At the time of his death Dan was 19 years of age. He was from Memphis, Tennessee. Dan is honored on the Vietnam Veterans Memorial at Panel 23E, Line 73. The decorations earned by PFC Dan Willie Archer Jr. include: the Combat Infantryman Badge, the Silver Star, the Purple Heart, the National Defense Service Medal, the Vietnam Service Medal, the Vietnam Campaign Medal and the Vietnam Cross of Gallantry with Palm Unit Citation. Dan Willie Archer was a devoted son of Dan Archer and Ted Archer of Memphis Tennessee. He was loved by many as a compassionate person who went into the military from a sense of duty and died protecting others in his unit. His selfless actions saved others but cost him his life after such a short time in Vietnam. Many miss him even today. I feel cheated that his life was cut short and not allowed to flourish. Who knows how many lives would have been different if he was not lost in the conflict? He was quick to laugh and had very red hair as his nickname was "Red". He was a good friend who offered much to humanity. I will always miss him. He was "Red" to the guys in the second platoon. He would clean that M60 machinegun like a hot rod car. He had short curly red hair, and the guy I could swear was a magnet, people loved being around him. He wasn't loud or anything, he wasn't a street kid, he just made people feel comfortable, I know they'd draw around him on breaks. I went through basic training in Ft. Campbell, Ky with Red Archer and I bumped into him with an M60 on his shoulder when his platoon (2nd Platoon, C Co., 1/35) came in for stand-down at LZ Montezuma at Duc Pho in Quang Ngai province. We remembered each other from basic. Red was killed in a battle that is glancingly referred to in the Vietnam Order of Battle. The author talks about a classic fire and manuever battle. It was, and it went for about six hours more or less. He was one of two guys killed in my platoon that day. Red was laying down some fire when I ran out onto a trail to try to drag two wounded guys back, I never made it. Got pinned down, got wounded. Red was killed I think by the same NVA regular who shot me through the back of the helmet. The rascal was up in a tree above and behind us both. Red never gave up. He was on the right of the firing line. Another machine gunner gave up and came running back to assisting with the wounded, including me. Like Abe Lincoln said, that boy had nervous legs, he couldn't help it. Red Archer did not have nervous legs. He laid down a devastating line of fire into some NVA bunkers on top of a mountain that day. He was shot from above and from the back just like I was. I made it, Red didn't. An hour or so into the battle they dragged Red back to me. I'd never seen a dead American soldier yet, I was pretty new to the war. Red was deathly pale, not breathing. I could't figure out where he'd been shot, but the guys showed me, they'd pulled off his shirt to bandage him. Red was hit just above the belt line in or very near the spine. He went quick. I understand the family didn't allow black friends to be kept out of the church the day of the funeral. He would have liked that I'm sure. Red was an only son who didn't have to go to war. He chose to do it. As a youngster he had a magnetic way with the neighborhood kids who'd gather around him to talk. I wish I'd been there to learn his secret. God bless you Red Archer, you are not forgotten. Hope to see you in Memphis some day. Well, Pal, here I am about 48 years after I met that "red headed" boy next door. I'll always cherish, you, Miss Ted, and Mr. D.W. You were such a brother to me growing up. Still recall going with you to your Boy Scout formal because you didn't want to ask a "real girl". We had some great times- bikes, bugs, and general mischieviousness. Even saw Sputnik fly over together. Always remember your B'day, and I hope you've found a wonderful supply of Pepsi to share with Mr. D.W. Love you. Relationship: Next Door Neighbor & "Sister"